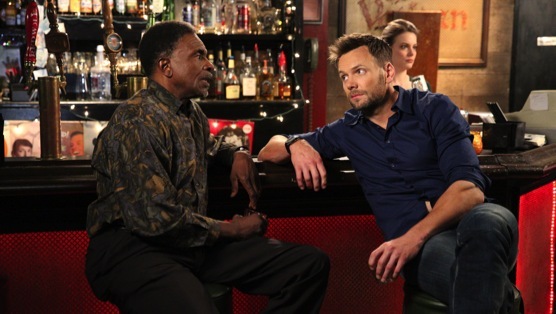 Community Review: "Advanced Safety Features"
All season I’ve been asking this question: what would a current episode of Community that both acknowledges the show’s past and doesn’t reset things at the end of the episode look like? These twin and related problems have plagued this show, giving us a comedy that knows how to tell a good joke , but doesn’t know how to tell a good story, especially on a macro level. These aren’t the only things that keep Community treading water, but they’re two of the biggest speed bumps. Fortunately, “Advanced Safety Features” doesn’t succomb to those problems, and while it’s arriving halfway into a largely disappointing season, that doesn’t mean it’s any less welcome. “Safety” is another episode that winnows down its stories to two, meaning that in almost 30 minutes of running time we had plenty of focus and depth on each half, to the point that Britta’s love interest was almost an entire broadcast-length episode in and of itself. That proved to be important, as instead of opting out for a cheap laugh, Community dug in and tried to tell the story more or less straight, which is to say with plenty of laughs but no narrative cop outs. To say that Community rarely knows what to do with Britta is an understatement. But as the seasons have gone on, there’s been an effort to both make her more cartoonish (which is to say, more like everyone else in the cast), and to give her a little depth. These would seem contradictory, but not in Community’s world, and “Safety” takes her in both directions at once without ever losing track of who she is. After we learn about a guerrilla marketing effort at Greendale, Britta learns that her Subway-shilling ex-boyfriend (whose name turns out to be Rick) is hanging around campus. They still have feelings for each other, and while Britta is pissed at him for putting his job, and products, before her in the past, that doesn’t mean she’s not willing to join him in the back of his Honda. It turns out, he’s of course the marketer, and what’s more, he’s doing an excellent job even if no one but Dean Pelton was listening to him. With this, there’s also very meta-product placement, much like with Subway in the past, but it doesn’t feel shoehorned into the story. Some people may mind this type of marketing, but it feels natural to the world of Community and far funnier than if the show had gone with a fake product. That being said, at the end of the episode, you probably won’t be able to get the term “Honda CR-V” out of your head. Rick tells Britta that there’s a way they could be together despite his job. If Britta joined him in a marketing scam two-person team, then they could be a couple publicly. She joins him in this, and it turns out that they do make a great team, but she’s not willing to either lose her personality to the job, or try to sell to her own family. She’s sleazy, but not quite that sleazy, and while Rick thinks he’s willing to quit in order to be with her, when it comes down to it, he’s not. Dean Pelton and Frankie catch him for his marketing (which is apparently illegal? Why?) and Britta leaves him. All of this is a surprisingly fulfilling Britta story, one consistent with who we know her to be, but still pushing on the boundaries of her identity. For once, the character seems to have given the show its concept rather than the other way around, and it really shows. The episode’s smaller story concerns the rest of the Committee’s attempt at befriending Elroy, who remains standoffish. After a little bit of work, though, he becomes close to most of the gang, but leaves the area whenever Jeff’s around. It turns out he thinks Jeff’s too cool for school, but when Jeff confronts him about this Elroy’s willing to accept that this type of vulnerability means it was all just an act. It’s a simple story, and its conclusion came on kind of quickly, but I was just thrilled that it acknowledged Elroy’s strange place in all of this. Had this episode come five episodes ago rather than now, it would’ve improved the entire season. These two stories came together at the end, too, making “Safety” feel far more controlled than most episodes this season. I don’t know if it was the funniest thing we’ve seen, but when stories and characters have that shred of realism in them, the laughs are deep and stick with you. Even the small details, such as the strange ears board game, were smart and memorable. Bringing Britta’s parents back, as well as Natalie Is Freezing, made Greendale feel more like an actual location again, rather than just a diorama. No one is going to mistake this for the first two seasons of Community, but for once it wasn’t trying to be. It was an example of the show’s later seasons forging a new identity, and doing so in ways that were both clever and meaningful. I have to admit, I really didn’t think the show could still pull something like this off.